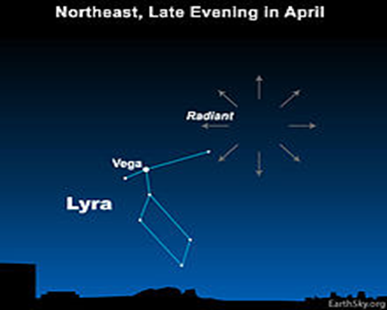 The annual Lyrid meteor shower takes place tonight and there will be a ‘watch’ event at Standalone Farm tonight. 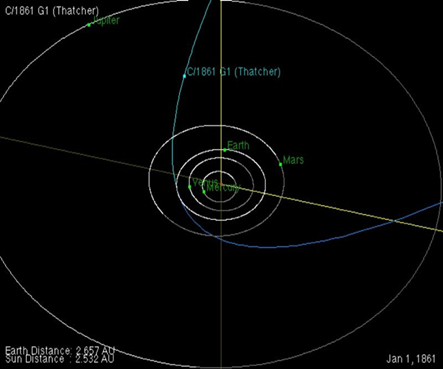 •It is the dusty trail of a Comet Thatcher (C/1861G1) which has a centuries long orbit around the sun. It orbits once every 415 years. There are no photos of it. •Observations of the Lyrid meteors go back to 687BC when the Ancient Chinese recorded the meteors as ‘falling like rain’. 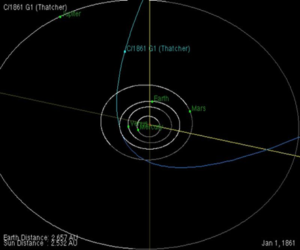 •Comet Thatcher last closest approach to the Sun (perihelion) was in 1861 and it won’t get back there until 2276. •The meteor shower occurs when the earth crosses the comet’s path and collides with the debris trail at 177,000 kph. This is why they seem to appear around the same time each year and in a specific area of the sky. •As the pieces burn up in the atmosphere the meteors leave a bright streak as they vaporise – we call these ‘shooting stars’. •Meteors if we don’t have any cloud or rain. There will be a waxing moon so they won’t be washed out in the moonlight. •At peak about 15 to 20 meteors per hour. The peak is on 22nd April just before the dawn. Where will the Meteor Watch be held? •The event starts at 10.00pm on Friday 20th April and finishes at 2.00am Saturday 21st April. •The event will be cancelled if the weather forecast is cloud or rain. What will I need on the night?